This weekend in the UFC Fight Night 119 main event, two middleweights will enter the Octagon. The first fighter is the wildly exciting and talented Derek Brunson, who possesses an abundance of athletic ability, power, and aggression, as well as a wrestling pedigree and constantly improving striking. 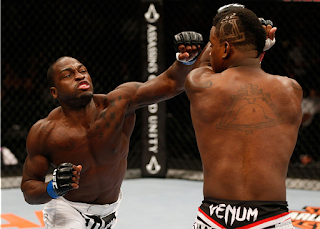 Brunson had been tabbed as an elite middleweight and a potential title challenger. 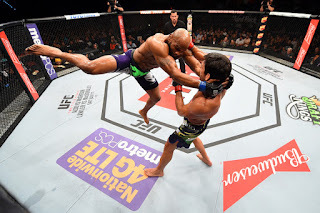 Two losses later -- one as the victim of a highlight reel finish at the hands of Robert Whittaker, the other a surprisingly confounding defeat to all-time great Anderson Silva -- Brunson now finds himself on the outside looking in, trying to regain some career momentum and fulfill the promise his talent and prior winning streaks assured us he would reach. On the other side we have former competitive Karateka and UFC Light Heavyweight Champion Lyoto “The Dragon” Machida, a fighter who, after initially experiencing a resurgence as an elite fighter after dropping down to middleweight, hit a hard slide. First he lost a competitive but one-sided fight to Weidman, then squeezed in a win over middleweight journeyman CB Dollaway before being brutally dispatched via submission by Luke Rockhold, a loss that was followed up by a dynamic knockout loss to Yoel Romero. Now coming off an extended period out of the sport due to suspension, Machida is back and hoping to get back on the winning track so that he can hopefully make one more run. Machida has been a riddle for the majority of his career, as his style of striking instantly impressed fans and confounded his opposition. The majority of his game is built around his unorthodox (for mixed martial arts) traditional martial arts background. His style places a heavy emphasis on circular movement, which keeps opponents from setting their feet to get their offense off explosively, while allowing him to leap in to reset and/or reposition, using singular strikes to pick opponents apart and disrupt any sort of rhythm they attempt to establish. The other approach used, and the one that pertains to the other subject of this article, is Machida’s habit of baiting an opponent to attack or to attempt to close distance, then countering. This has been the hallmark of his game, most famously being highlighted when Machida lured current Bellator Light Heavyweight Champion Ryan Bader into a fight ending strike. 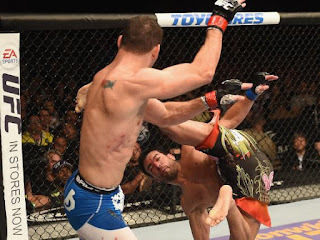 But as effective as Machida’s style has proven to be, the fact of the matter is there were definite holes in it, specifically his vulnerability to leg and body kicks, exploited by MMA legend and former UFC Light Heavyweight Champion Mauricio “Shogun” Rua. The other downside was the fact that his low output, defensive first style put him on the bad end of a few decisions, such as his losses to Quinton “Rampage” Jackson and Phil Davis. Yet as big an issue as those stylistic limitations were, physical decline was the motivating force behind him making modifications to his overall style and his general approach to fighting. Instead of using his stance and footwork to create angles to get in and out, or to maintain distance while pot-shotting opponents, Machida began to place an emphasis on being offensively assertive. He started to sit down on his shots to throw more volume and power, as well as use his unique footwork to apply steady pressure to cut the cage down on opponents, which provided him with more opportunities to open up. His key weapons are still the straight left and the left kick, and he is still stunningly effective on the counter, but the emphasis has clearly been focused on being more offensively active and damaging, which forces him to work at a closer range and take more risks. In short, his focus on defense has lessened in favor of this newfound (and needed) focus on offense. This strategic change highlights how solid Machida’s takedown defense is, as he is now pressuring opponents and staying in arms reach of their takedown attempts and their strikes. This means Machida is regularly putting himself in a position to be taken down and is still able to consistently and effectively shut down the large majority of his opponents’ takedown attempts. Another change in Machida’s game has been the removal of body lock takedowns and clinch trips, the reason probably being that he is now applying pressure instead of trying to disrupt it to maintain his distance and ability to control the pace of fights. His ground game is still functionally effective, especially as it pertains to working from the top position or getting back up from the bottom position, but outside in of these areas, Machida is both overrated and ineffective there. 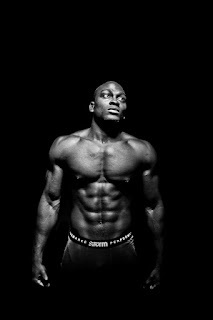 Derek Brunson is the complete opposite of Lyoto Machida. He does not own a long and storied combat sports career prior to mixed martial arts, nor has he been as accomplished as a professional mixed martial artist. No, Brunson is a big, athletic, strong, dynamic, and powerful YOUNG man, and the majority of his game is built around taking full advantage of those attributes through intense (and sometimes undisciplined) aggression. At range Brunson often relies on round kicks and a very heavy front to act as a line of defense, a line of offense, and a means to control his opponents’ aggression, offensive rhythm, and distance management. The other weapon that is a hallmark of Brunson’s game is his explosive (and wild) left hand. The weapon use is twofold: first it is destructive and capable of doing huge amounts of damage, if not stopping opponents in their tracks. The second and less noticed usage is that it enables (and disguises) attempts to transition into the area where he is strongest, the clinch. In the clinch Brunson likes to beat up his foes with a combination of short punches to the head and body, as well as knees. The power and rapidity of these strikes often allows him to transition to a series of trips that unbalance opponents, creating more openings for strikes. The clinch work also works in reverse, as the strikes set the table for the takedown attempts he chains together, working from trips (inside/outside), to singles, doubles, and back into the clinch. 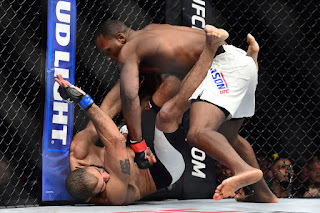 As adept as Brunson has shown himself to be in getting takedowns and using takedown attempts to create opportunities to damage opponents, he has proven equally adept at defending takedowns, generating offense off of failed attempts, and deftly working his way back to his feet when they are successful. On top of the work he does on the feet and to get the fight to the ground, Brunson’s ground and pound is savage in its intensity. For a fighter with an abundance of raw physical talent, and a game built on aggression and activity, Brunson is surprisingly layered and nuanced. But with all this dynamic talent and well-schooled, balanced, and diverse skills, how it is that Brunson has lost 2 of his last 3 fights (only beating overachieving middleweight Dan Kelly)? Well, the same thing that brought him to the dance is the same thing that is taking him home from it. 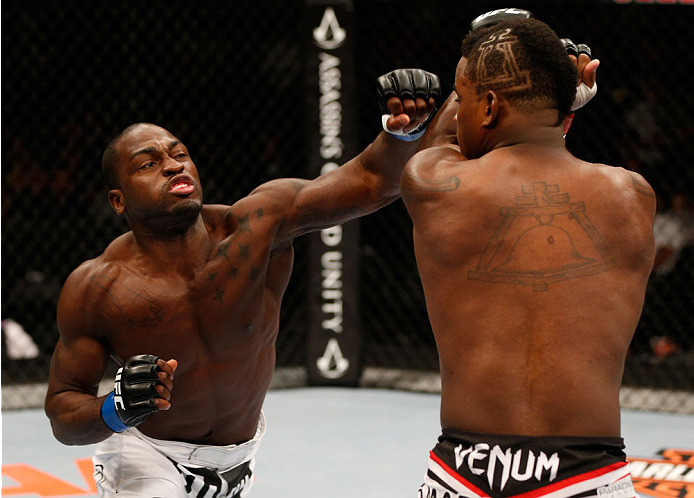 Brunson’s fight game is intelligent and layered, but as mentioned earlier, it’s not particularly disciplined. And in his attempts to bring his natural abilities and wrestling pedigree to bear, Brunson will often unbalance himself by over-pursuing, exploding across distance instead of carefully measuring and working his way into the ranges he wants. This often leads him to the root of his losses, counters. Brunson has been unable to develop his offensive footwork or his overall striking game to the point where he can create angles to enter on, nor has he developed a consistent jab to act as a lead in (and a line of defense) for his offense as he transitions into the pocket. He was stopped by Robert Whittaker as a result of running into counters (a la Ronda Rousey), and his inability to effectively use controlled aggression, or to work himself into position to be offensively consistent, resulted in a “disputed” loss to Anderson Silva. It seems that Brunson hasn’t mastered the balance between effective and reckless pressure, between disciplined and undisciplined aggression, instead leaning too much on his ability, which is ineffective the minute he fights in anything resembling a deliberate and patient manner. On Saturday night we will get a great example of matchmaking for two fighters. One is a seasoned veteran who is proven, having beaten world class competition in two divisions, but has lost a step or two and hasn’t shown himself capable of continuing to perform at the world class level. Can he defeat an opponent with top end athleticism, an opponent with a complete tool set, an opponent who is on his way up in regards to his physical and technical tools? Recent attempts have led to crushing and somewhat embarrassing stoppages to Yoel Romero and Luke Rockhold. in Brunson, Lyoto Machida has an opportunity to show that he can handle all the aforementioned things and that he is in fact back to being a legitimate contender, and not just a feelgood story overachiever. 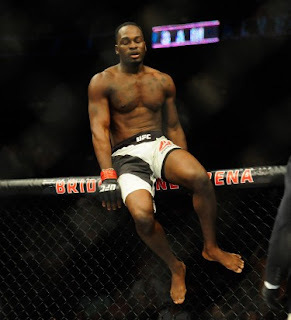 For Derek Brunson, this is yet another opportunity to show he can beat a guy who has poise, has maturity, has a defined identity, a high cage IQ, and a counterpunching style; in all these fights against guys who fit this description, Brunson has failed, repeatedly. Lyoto Machida doesn’t have top end athleticism anymore, nor has he been as successful as Brunson has been recently, but he is savvy, poised, awkwardly effective on the counter, and is a former champion and ranked contender in two weight classes. This is a fight to show that Brunson can make good on the promise his talent and previous five-fight win streak gave us. In a crossroads fight between two fighters on opposite ends of the spectrum in age, physical condition, athleticism, experience, and wins/losses, both fighters are trying to prove something. On Saturday night at UFC Fight Night 119, something will be proven to be more or less true than we previously thought when the cage door closes and it gets real.